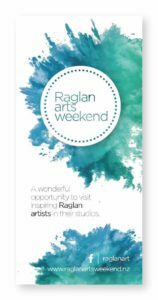 Raglan artists will soon open their studio doors to art lovers across the country for the 10th Raglan Arts Weekend – RAW – in Easter 2019. Two RAW artists looking forward to discussing their work with visitors are husband and wife duo, Toni Kingstone and Greg Hogan. Whilst Toni is no stranger to the Raglan Arts Weekend, Greg will be exhibiting for the first time, bringing a fresh new dimension with his ironwork skills. 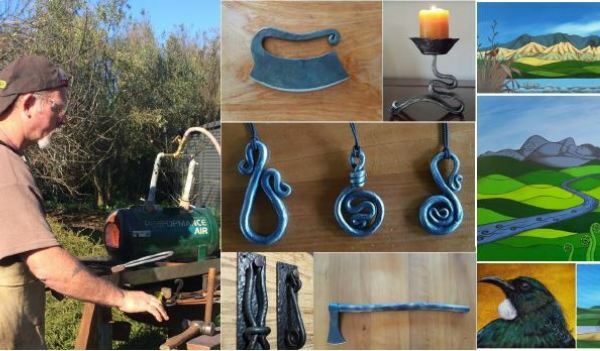 Two years later, Greg has now progressed to a gas forge and his creations include door knockers, candlesticks and other homewares, along with jewellery and more artistic pieces. It’s been an exciting couple of years for Toni too since she took part in the Raglan Arts Weekend for the first time in 2017. Since then, she’s exhibited at Raglan’s Rivet Gallery, the Old School Arts Centre, Arts Post Gallery and in solo exhibitions at Colour Burger Studio in Te Awamutu and the WSA Next Level Gallery in Hamilton. As an artist, Toni is heavily influenced by the surrounding countryside, in particular by the local maunga and native birds. Mainly working in acrylics and charcoal, she creates peaceful artworks that combine nature’s elements, often incorporating hidden objects the viewer may not see at first glance. During RAW Toni and Greg can be found at Ruapuke Retreat, 527 Ruapuke Rd (GPS, 564 Ruapuke Rd).